Gabriel Stefan "Gabe" Kapler (born July 31, 1975) is a former Major League Baseball outfielder. He played portions of 13 seasons with the Detroit Tigers, Texas Rangers, Colorado Rockies, Boston Red Sox, Milwaukee Brewers, and the Tampa Bay Rays. He is 6 feet 2 inches tall, and weighs 205 lbs. Kapler is Jewish, and to honor his heritage, has a Star of David tattooed on his left calf, with the inscription "Strong Willed, Strong Minded" in Hebrew, and the post-Holocaust motto "Never Again" with a flame and the dates of the Holocaust on his right calf. He describes his background as "culturally Jewish. ... I was—and am—proud of my heritage, but don't practice religion." Kapler has been given the nickname Hebrew Hammer due to his frequent longball hits, along with his muscularity and the fact that he is Jewish. It later became the nickname of Ryan Braun, who is also Jewish, and was Kapler's teammate on the Brewers. On September 27, 1999, the Tigers commemorated the closing of Tiger Stadium by wearing the numbers of greats from the organization's history. Kapler's jersey was blank, an homage to Ty Cobb, who competed before players received numbers. This was ironic, as Cobb was a notorious anti-Semite. 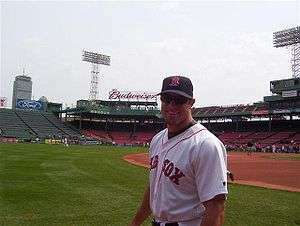 On August 8, 2005, while playing for the Red Sox, Kapler took the field in the 9th inning along with Kevin Youkilis and Adam Stern, setting a "record" for the most Jewish players on the field at one time in American League history and the most in Major League Baseball history since four Jews took the field for the New York Giants in a game in 1941. In 2008, with his career 69th home run he passed Art Shamsky and Lou Boudreau for 9th on the all-time list for home runs by Jewish major leaguers. Kapler was the unanimous winner of the 2008 Jewish Comeback Player of the Year award. Through 2010, he was 10th all-time in career home runs among Jewish major league baseball players. Kapler played for the Taft High School baseball team, and graduated in 1993. He attended Cal State-Fullerton in 1994 on scholarship, before transferring to 2-year Moorpark College in 1995. He was named 1st team All-Western Conference after hitting .337 with 7 homers and 52 RBIs. Kapler was inducted into the Moorpark College Athletic Hall of Fame in 2008. Kapler is an avid weightlifter. He was on the cover of several fitness magazines and became renowned for being the focus of an entire K-Swiss shoe campaign before he had even reached the pros. Kapler was a 57th-round draft pick (1,487th overall) by the Detroit Tigers in 1995. In 1996 he led the South Atlantic League in hits (157), doubles (45; 2nd in the minor leagues), and extra-base hits (71), was 2nd in homers (26), RBIs (99), and slugging (.534), and 5th in batting (.300). He was named a South Atlantic League All-Star. In 1997 at Single-A Lakeland, he led the Florida State League in doubles (40) and total bases (262), tied for first in extra base hits (65), was 2nd in games, 3rd in hits (153), tied for 3rd in home runs (19) and RBIs (87), was 4th in slugging percentage (.505), and tied for 4th in runs (87). In 1998 at AA Jacksonville Suns, he won the Southern League Most Valuable Player Award, as he batted .322 with a league-high 28 home runs, 47 doubles (3rd-most in the minor leagues), and 146 RBIs (most in the minors in 1998 and most ever in the Southern League). His league record for RBIs broke the 1986 record of 132 set by Terry Steinbach. He also set league records with 81 extra-base hits and 319 total bases, and broke the old doubles record of 44 with 47. He also led the league in hits (176; 8th-most in the minors), runs (113; 6th-most in the minors), and finished 6th in batting. He played in both the Double-A and Southern League All-Star Games and was recognized as MVP of the Southern League All-Star Game. He was also named to the SL's post-season All-Star team. He was honored as Minor League Player of the Year by USA Today, Baseball Weekly, and The Sporting News and USA Today, and was named Tigers Minor League Player of the Year and Detroit's No. 1 prospect by Baseball America. He made his Major League debut in 1998 at the age of 22. He became the first Tiger since the inception of the draft in 1969 to be selected as late as the 57th round and reach the majors. He had one hit in four at-bats in his debut. In 1999, he hit his first career home run on April 30 against Albie Lopez of the Tampa Bay Devil Rays. He wound up hitting a career-high 18 home runs in just over 400 at-bats, third among AL rookies. His 10 home runs in his first 64 games was the fastest by a Tiger rookie since 1954, and was not surpassed until 2008. In November 1999, he was traded by the Tigers with Al Webb (minors), Frank Catalanotto, Francisco Cordero, Bill Haselman, and Justin Thompson to the Texas Rangers for Juan González, Danny Patterson, and Gregg Zaun. Kapler hit two home runs the next Opening Day for the Rangers, and had a team record, major-league-high 28-game hitting streak later that season. In 2000 he batted .302 with 14 home runs, hitting .344 in the second half of the season. In 2001 he stole 23 bases and had 8 assists from center field for Texas. He batted .267, but .329 in games that were late and close. He made just one error in 344 total chances for a .997 fielding percentage, second-best in the AL. In July 2002, he was traded by the Rangers with Jason Romano and cash to the Colorado Rockies for Dennys Reyes and Todd Hollandsworth. In 2002, he batted .279, but .321 in games that were late and close, and .357 with runners in scoring position. Kapler with the Boston Red Sox in 2004. In June 2003, he was acquired by the Boston Red Sox from the Rockies. In 2004, when Shawn Green of the Dodgers announced that he would not play on Yom Kippur, the Boston media asked Kapler if he would do the same thing. Kapler called a Boston-area rabbi for advice. With the Curse of the Bambino still hanging over Red Sox fans' heads, the rabbi reportedly said: "Do it! We need all the help we can get!" Kapler decided to play. Kapler played a career-high 136 games in 2004, hitting 6 home runs and driving in 33 runs in 290 at-bats. He batted .272, but .303 in games that were late and close. He also led the team with 6 outfield assists. In Game 4 of the World Series, Kapler had been a pinch runner, but manager Terry Francona left him in the game to play right field in the ninth. Kapler joined an exclusive club, as one of the nine players who were on the field when the Red Sox won their first title in 86 years. Less than one month after the Red Sox dramatic 2004 World Series victory over the Cardinals, Kapler departed for Japan's Yomiuri Giants. He received a $2 million deal plus a $700,000 signing bonus, compared to the $750,000 salary he had received from the Sox. Driven by the memory of an elementary-school report that he had written about Japan, he felt it was time for a change. "I tend to make emotional decisions," he said. "I did it more for the life experience than anything else. And ever since I wrote that report, I’ve been fascinated by everything that an 8-year-old associates with a country far, far away." He struggled in 38 games in Japan, and was placed on the inactive list by Yomiuri in the 2005 mid-season. Kapler was re-signed by the Red Sox in July 2005, just a few hours after clearing Japanese Central League waivers. In September 2005, Kapler ruptured his left Achilles tendon while running the bases on what turned out to be a home run by teammate Tony Graffanino. This ended Kapler's season. In 2006, Kapler finally came back from his injury in June, and had his best OBP in 5 years (.340), hit .316 with 2 out and runners in scoring position, and played error-less outfield for the second year in a row. He served the Boston Red Sox as manager of their Single-A affiliate, the Greenville Drive, for one season in 2007. The team went 58–81, and finished in 7th place in the South Atlantic League Southern Division. "I miss the battle. I still need to be on the field as a player." On September 20, 2007, after only one season as a manager, Kapler announced that he would like to return to play Major League Baseball in 2008. Kapler, 32 years old at the time, had a career .270 batting average, along with 64 home runs, with 302 runs batted in. Kapler had last played on October 1, 2006, for the Red Sox. On December 20, 2007, Kapler signed with the Milwaukee Brewers to a one-year, non-guaranteed contract that paid $800,000 when Kapler made the roster. "He knows he has to come in and win a job. I don't think this was about the money for him. It was about getting a chance to play again. He has great work ethic. People love the way he plays the game. He's a guy with Major League experience and can play all three outfield positions. And this guy is in better shape than our 25-year-old guys." The initial plan, before Mike Cameron was acquired, was to have Kapler replace the non-tendered Kevin Mench as a right-handed option to share time with Tony Gwynn, Jr., Gabe Gross, and Joe Dillon, in left field. With a focus on defense, Yost indicated in March that Gwynn and Kapler might have a leg up on Gross. "He's been very impressive so far", said Brewers manager Ned Yost in March. "I would have never known he took a year off. He does not show any signs of it to me. While Cameron served a 25-game suspension to start the season for twice testing positive for a banned stimulant in the fall of 2007, Kapler made the club, and began to see action in center field. On April 5, 2008, he hit the first pinch-hit home run of his career for Milwaukee in the 7th inning of a game against the San Francisco Giants. Kapler started the season as the Brewers' hottest hitter, going 11-for-26 with 4 home runs and 11 RBIs. Kapler gave fans a taste of his hard-nosed style against the Dodgers on August 16. He ran full-speed after Russell Martin's long fly in the seventh inning, snagging the ball to deprive Martin of a home run as he toppled head-first into the left-field seats. The outstanding catch helped the Brewers hold onto a one-run lead, and earned Kapler the Play of the Year Award, voted by over 12 million fans in major league baseball's This Year in Baseball Awards. Similarly, three days later Kapler made a diving catch in left field to rob Ty Wigginton of a hit, and on September 6 Kapler ran down a blooper to center and made an outstanding diving catch. Kapler missed the last two weeks of the season as well as the NLDS after tearing his latissimus dorsi muscle while pitching in mid-September. ""He's as good a backup outfielder as there is in baseball. He could be a starter on most teams." For the year, Kapler batted .301, with a .498 slugging percentage, hit 8 home runs, and was 3 for 4 in stolen bases, playing most of his games in center field, and batting .386 with a .632 slugging percentage in tie games. Kapler started 43 games. He was the club's best pinch-hitter, batting .323 with 2 homers (the first pinch-hit shots of his career) and 8 RBIs. Kapler was mentioned as a candidate for, but did not win, the NL Comeback Player of the Year Award. On October 30, 2008, Kapler filed for free agency. On January 12, 2009, Kapler signed a one-year contract with the Tampa Bay Rays for $1,000,018. The extra $18 was chosen because it represented the symbol for "life" in Judaism. He started the season platooning in center field with Matt Joyce, in place of Rays center fielder B.J. Upton, who had offseason surgery on his left shoulder, and was not ready for Opening Day. On April 13, 2009, Kapler struck out against New York Yankee outfielder Nick Swisher. Kapler then began to platoon in right field with Gabe Gross. Kapler ended the season at .354 with 4 homers in 82 at bats against left-handers. In this role he almost broke Mark Buehrle's Perfect Game on July 23, 2009. Leading off the ninth inning against the White Sox, he was robbed of a home run by a leaping DeWayne Wise, a ninth inning defensive replacement. Through July 10, despite a slow start, Kapler had the best slugging percentage of his career (.505), and was batting .320 with a 4 home runs in 75 at bats and a .680 slugging percentage against left-handers. As of July 10, 64% of his hits in 2009 had been for extra bases, which would be first in the major leagues for a player with at least 100 plate appearances (Kapler had 129). Kapler was re-signed by the Rays on October 27, 2009, to another one-year contract, this time for $1.05 million. Over 2009-09, Kapler hit .304 against left-handers with a .577 slugging percentage, 11th-best in the Major Leagues. "Over the past two years, Kap has been one of the best in baseball against left-handed pitching", said Rays executive vice president of baseball operations Andrew Friedman. "Because he's also a plus defensive outfielder, he's become a tremendous asset here. His value even extends beyond the field; his knowledge and presence make him a positive influence on our younger players." In a December interview manager Joe Maddon said: "I'm still a big Gabe Kapler fan. You look at his OPS over the last couple of years versus left-handed pitching, it's among the best in all of baseball". Heading into spring training in 2010, it appeared that Kapler was likely to platoon in right field with Matt Joyce. However, he appeared in only 59 games that season, hitting a career worst .210 with only 2 home runs and became a free agent after the season. On January 18, 2011, Kapler signed a minor league contract with the Los Angeles Dodgers. He also received an invitation to spring training. Kapler was released on March 31, 2011. Kapler coached for the Israeli national baseball team in the 2013 World Baseball Classic qualifier in September 2012. Israel lost to Spain in extra innings in the Pool Finals, and did not qualify to play in the World Baseball Classic. In the summer of 2013, Kapler became an analyst for Fox Sports 1 cable network. He appeared frequently on the network's Fox Sports Live program since the network debuted on August 17, 2013 as well as MLB Whiparound since the program's inception in March 2014. Two of his segments were "Saberclips", where he explained advanced statistics and sabermetrics used in baseball, and also "In the Cage", where he gave out advice for young baseball players what to train for when they hit the batting cage. On November 7, 2014, he was hired by the Dodgers to become the team's new Director of Player Development. In that position, he managed to make all the affiliates in the Dodgers farm system, as well as the major league team, switch to serving entirely organic food. He was one of the favorites to become the new Dodgers manager following the departure of Don Mattingly but lost out to Dave Roberts. Kapler and his wife, Lisa, co-founded the Gabe Kapler Foundation, which is dedicated to educating the public about domestic violence and helping women escape abusive relationships. Kapler was born in Hollywood, California. Kapler and his wife, Lisa (Jansen), have two sons, Chase Ty and Dane Rio. Kapler filed for divorce from his wife in October 2013. Kapler is well known in baseball for his extraordinary musculature. Boston Globe columnist Bob Ryan nicknamed Kapler "The Body." In a clubhouse poll, it was once revealed that of the 25 players on the Red Sox, 24 were Republicans and Kapler was the one Democrat. Kapler has 11 tattoos, mostly on his legs, including the Star of David, and "Never Again, 1933–1945", referencing The Holocaust. ↑ "Gabe Kapler Stats, Bio, Photos, Highlights". mlb.com. Retrieved August 24, 2011. ↑ Kapler, Gabe (April 7, 2014). "How I was fooled by Chad Curtis's religious beliefs". Fox Sports. Retrieved April 9, 2014. ↑ Couch, Greg (September 20, 2007). "FanHouse". aol.com. Retrieved March 16, 2010. ↑ "New faces, position changes for Brewers this spring". ESPN. February 24, 2008. Retrieved March 12, 2009. ↑ Paul Lukas (April 2, 2007). "Uni Watch: Passover edition Page 2". ESPN. Retrieved March 12, 2009. ↑ Shlomo Kapustin (September 29, 2005). "It started as a great idea, then fate stepped in". Jewish Tribune. Archived from the original on November 16, 2008. Retrieved March 12, 2009. ↑ Career Batting Leaders through 2007, jewishmajorleaguers.org. Retrieved September 15, 2008. ↑ "Youkilis, Grabow, Kapler named best Jewish Major Leaguers". New Jersey Jewish News. January 1, 2009. Retrieved March 12, 2009. ↑ "Moorpark Hall of Fame to induct nine new members : College". Ventura County Star. January 25, 2008. Retrieved March 12, 2009. ↑ "Batting Leaders". Minors.baseball-reference.com. Retrieved October 6, 2010. ↑ Archived August 4, 2008, at the Wayback Machine. ↑ Grant, Evan (October 15, 2011). "Remember Rangers trade of Juan Gonzalez to Detroit? May lead to consecutive AL pennants". Dallas Morning News. Retrieved November 10, 2014. ↑ Topkin, Marc. New outfielder Kapler an offbeat guy who's in tune with the Tampa Bay Rays' needs, St. Petersburg Times. Published March 16, 2009. ↑ Henson, Steve (August 23, 2000). "Hit Parade". Los Angeles Times. Retrieved November 10, 2014. ↑ "Rangers, Rockies swap four players". Amarillo Globe News. Associated Press. August 1, 2002. Retrieved November 9, 2014. ↑ "Mets Acquire Pitching Help". Los Angeles Times. August 1, 2002. Retrieved November 9, 2014. 1 2 Browne, Ian (July 15, 2005). "Popular Kapler returns to Red Sox". MLB.com. Retrieved November 10, 2014. ↑ ".". yudu.com. August 8, 2005. Retrieved February 18, 2011. 1 2 3 Robinson, Joshua (April 13, 2008). "Long Road Leads Back to the Outfield for Kapler". The New York Times. Retrieved May 3, 2010. 1 2 "Scout.com: Red Sox Notebook". Braves.scout.com. December 29, 2007. Retrieved March 12, 2009. ↑ Petraglia, Mike (December 12, 2006). "Kapler announces retirement". MLB.com. Retrieved November 10, 2014. ↑ Ryan, Bob (March 7, 2007). "Kapler is managing nicely". Boston Globe. Retrieved November 9, 2014. ↑ Adam McCalvy (December 20, 2007). "Brewers, Kapler agree to one-year deal". Mlb..com. Retrieved March 12, 2009. ↑ Wilbur, Eric (September 20, 2007). "Kapler wants a return – Extra Bases". Boston Globe. Retrieved March 12, 2009. ↑ "Topic Galleries". Chicago Tribune. Retrieved March 12, 2009. ↑ "Chicago Sports news". Chicagosports.com. Retrieved March 12, 2009. ↑ Renck, Troy E. (March 2, 2008). "Kapler's drive to play won't melt away". The Denver Post. Retrieved March 12, 2009. ↑ Adam McCalvy. "Kapler continues his pursuit of a return". Mlb.com. Retrieved March 12, 2009. 1 2 "Wisconsin State Journal". Madison.com. March 19, 2008. Archived from the original on March 22, 2008. Retrieved March 12, 2009. ↑ "Jon Heyman: Kapler managing a quick return to prominence – Jon Heyman". Sportsillustrated.cnn.com. April 14, 2008. Retrieved March 12, 2009. ↑ Rosenthal, Ken (April 17, 2008). "Brewers reaping rewards from Kapler's change in course". Fox Sports MSN. Retrieved November 10, 2014. ↑ Tim Ott (December 18, 2008). "Season's finest claim TYIB Awards". Mlb.com. Retrieved March 12, 2009. ↑ "Brewers report card: Players". JSOnline. October 9, 2008. Retrieved March 12, 2009. ↑ Adam McCalvy. "Yost credits Kapler's time away". Mlb.com. Retrieved March 12, 2009. ↑ "Phils Look To Add a Righty". Bleacher Report. January 11, 2009. Retrieved March 12, 2009. ↑ "Brewers report card: Team grades". JSOnline. October 9, 2008. Retrieved March 12, 2009. ↑ Mychael Urban (September 28, 2008). "This year in baseball great early to late". Mlb.com. Retrieved March 12, 2009. ↑ Adam McCalvy (October 30, 2008). "Brewers prepare offer for Sabathia". mlb.com. Retrieved March 12, 2009. ↑ Bill Chastain (January 12, 2009). "Kapler added to Rays' outfield mix". MLB.com. Retrieved January 12, 2009. ↑ Rogers, Phil (February 26, 2009). "Phil Rogers' MLB whispers". Chicago Tribune. Archived from the original on February 19, 2009. Retrieved June 29, 2015. ↑ Bill Chastain. "Kapler added to Rays' outfield mix". Mlb.com. Retrieved March 12, 2009. ↑ Bill Chastain (January 15, 2006). "Rays reload for another run". mlb.com. Retrieved March 12, 2009. ↑ "Looking at a Platoon: Gross/Kapler". Fangraphs.com. April 3, 2009. Retrieved March 16, 2010. ↑ "Topic Galleries". Chicago Tribune. Retrieved March 16, 2010. ↑ "Gabe Kapler Split Statistics". Mlb.com. July 31, 1975. Retrieved March 16, 2010. ↑ "Kapler is a Powerful Man," MVN.com, 7/10/09, accessed 7/18/09 Archived March 3, 2016, at the Wayback Machine. ↑ "Tampa Bay Rays re-sign outfielder Gabe Kapler". tampabay.com. October 27, 2009. Archived from the original on October 29, 2009. Retrieved March 19, 2010. ↑ Bill Chastain. "Rays lock up Kapler for one more year; Veteran confident team can return to Series in 2010, 10/27/09". Mlb.com. Retrieved March 19, 2010. ↑ "Maddon: Bartlett at the top, and other things". Blogs.tampabay.com. December 8, 2009. Archived from the original on January 13, 2010. Retrieved March 19, 2010. ↑ Bill Chastain (May 31, 2009). "Hard work has Joyce back in Majors mix Outfielder ready to use learning experience to help Rays win", February 26, 2010". Mlb.com. Retrieved March 19, 2010. ↑ Nicholson-Smith, Ben (January 18, 2011). "Dodgers Sign Gabe Kapler". MLB Trade Rumors. Retrieved November 9, 2014. ↑ Gurnick, Ken (November 7, 2014). "Dodgers add Kapler, Gasparino to staff". MLB.com. Retrieved November 9, 2014. ↑ "Astros select Fields, Freiman in Major League portion of Rule 5 Draft". mlb.com. Retrieved March 12, 2013. ↑ Saxon, Mark (February 27, 2015). "Dodgers going organic this season". ESPN. Retrieved December 8, 2015. ↑ "Report: Dave Roberts, Gabe Kapler top candidates for Dodgers manager". Sports Illustrated. November 9, 2015. Retrieved December 8, 2015. ↑ Cwik, Chris (November 23, 2015). "Gabe Kapler calls Dodgers manager Dave Roberts 'exceptional individual'". Yahoo! Sports. Retrieved December 8, 2015. ↑ ''Men and Feminism: Seal Studies'', Shira Tarrant. Seal Press. 2009. ISBN 1-58005-258-4. Retrieved March 19, 2010. ↑ Granberry, Michael (June 3, 2000). "TOUCHING BASE with Gabe Kapler". Dallas Morning News. (subscription required (help)). ↑ Rutttman, Larry (2013). American Jews and America's Game: Voices of a Growing Legacy in Baseball. University of Nebraska Press. p. 416. ISBN 9780803264823. ↑ "MLB Stud Gabe Kapler Files for Divorce Gimme My Maiden Name Back! [Update]". TMZ. October 6, 2013. Retrieved November 9, 2014. ↑ Shanahan, Mark; Goldstein, Meredith (October 7, 2013). "Gabe, Lisa Kapler to divorce?". Boston Globe. Retrieved November 9, 2014. ↑ Santoli, Michael June 23, 2014 (June 23, 2014). "Gabe Kapler: From beefy ballplayer to healthy-lifestyle guru". Yahoo! Finance. Retrieved November 9, 2014. ↑ "The Point After» One random question: Who are you voting for?". Boston Herald. January 8, 2008. Retrieved March 12, 2009. ↑ Samuels, Matt (June 3, 2010). "Getting to know Gabe: Kapler talks baseball, Jewish pride during Houston trip". Jewish Herald Voice. Retrieved November 9, 2014. ↑ "Where Have You Gone, Sandy Koufax". Heeb. February 1, 2004. Retrieved November 9, 2014.